Alpendohlen, auch Bergdohlen genannt, sind Brutvögel der Hochgebirge der südlichen Palearktis und kommen in Mitteleuropa gewöhnlich zwischen 1500 und 3900 Metern Höhe vor. 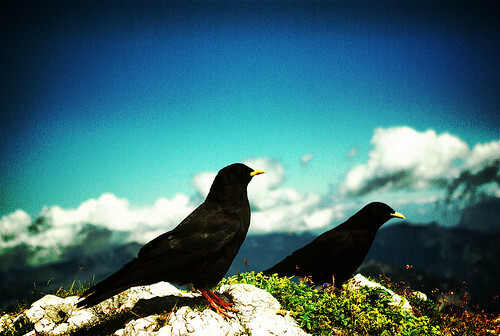 The Alpine Chough or Yellow-billed Chough, (Pyrrhocorax graculus) is a bird in the crow family, one of only two species in the genus Pyrrhocorax. Its two subspecies breed in high mountains from Spain east through southern Europe and North Africa to Central Asia, India and China, and it may nest at a higher altitude than any other bird.